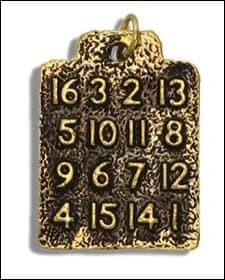 From the mystical Hebrew tradition known as the Kabbala comes the most influential amulet of them all, the Magic Square. One of the oldest amulets known to man, this potent piece could bring a person good luck in all aspects of his or her life. An extremely powerful talisman containing numbers that add up to the same total whether adding horizontally, vertically, or diagonally. This special good luck piece could dramatically sharpen your instincts and increase your luck. Merely hold the this powerful amulet while you’re selecting numbers and the correct numbers may begin to emerge from your subconscious mind. The Magic Square may be particularly useful in games of chance, such as the lottery. Ordering the Magic Square today could turn your hard luck into good luck. Plated in 14-karat gold, this versatile charm can be worn or carried. I ordered a Magic Square and received on the 10th of Febuary. I followed the instructions, and the very next day I went to casino played bingo. I won $630, and then I played the dollar machine and got a free spin — I hit the $1,000 jackpot! Thank you for all the good things you do may god bless you.